RECIPE TITLE "Zesty Caribbean Chicken Breasts"
Juicy and tender, our grilled chicken breasts are coated in a marinade that's both spicy and sweet. The sweet glaze, flecked with bits of lemon peel, comes from the honey that's added to the marinade. In a shallow baking dish combine marinade ingredient; stir well. Add chicken. Turn to coat. Refrigerate 30 minutes or up to 4 hours, turning occasionally. 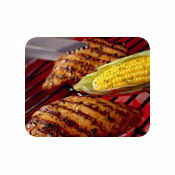 Heat broiler or prepare grill. Remove chicken from lemon juice mixture. Broil or grill 6 to 7 minutes per side or until chicken is no longer pink in center. Recipe reprinted by permission of Crisco®. All rights reserved.